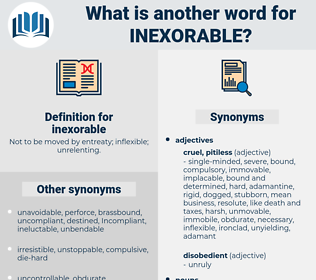 What is another word for inexorable? Not to be moved by entreaty; inflexible; unrelenting. unavoidable, irreversible, ruthless, brutal, remorseless. inescapable, inevitable, relentless, unrelenting, unstoppable, merciless, irresistible. nice, merciful, flexible, yielding, kind, sympathetic, lenient, remorseful. pliable, gentle, mild, tractable, tender, sweet, easy, soft, bland, genial, affable, indulgent, placable. But the Hartford commissioners were inexorable. She was slow, sluggish, but inexorable.